Our borrowed bull arrived on July 29th. He has been a good boy and we’re just about finished with him. In fact, I believe he has completed his work…we’ll just keep him around for a couple more weeks for insurance. It was interesting to watch him pair up with a different heifer every few days though he was fairly discreet about his work. July 29 he was not discreet. That means we should be ready for a calf around or before May 7th. So, realistically, our calving window is all of May and most of June. That puts calving a little…maybe a lot…later than I would like but we should be safe. It’s late enough for good grass for the last 30 days of gestation, early enough to avoid the punishing heat…well, most years. 2012 was an unusually warm year and it started early. My cousin planted corn on St. Patrick’s day, the same time I was planting potatoes. It was lucky he planted early as that corn made where later plantings either didn’t make or were affected by aflatoxin. By April 10 of 2012 our pastures were growing very well. I would love the early spring of 2012 if I could retain the mild summer of 2013 along with it. Otherwise I’m content to hold off a little bit. Once again, the same ground, same angle on May 4,2013. 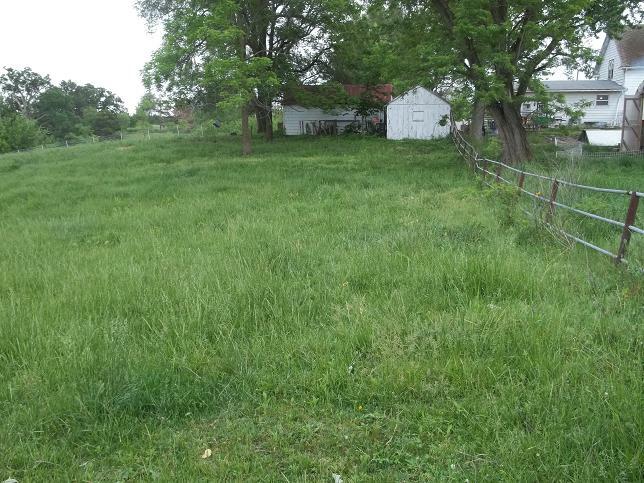 It looks like there is not as much forage available in the 2012 picture but you should know the goats and chickens both grazed across it that spring before the picture was taken as well as the tenant’s cows. In the cow picture from 2013 the cows are running across for the first time, though I did feed hay on pasture the month prior. 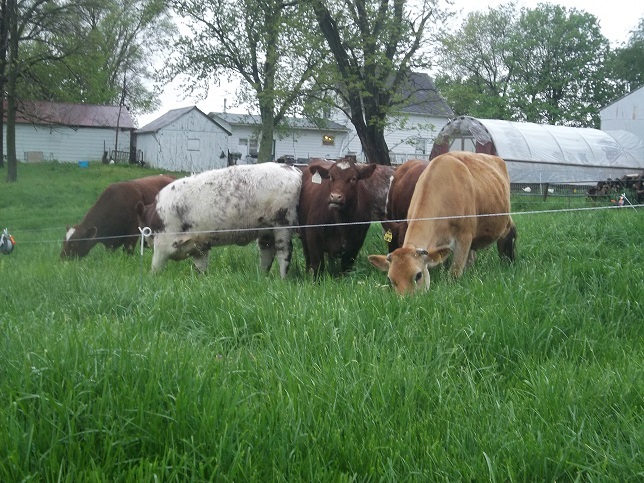 Based on what we have recorded of our own pastures, it looks like we’ll have a terrific quantity of high-quality forage just in time for calving next spring, even if spring comes a little early. Let’s push this out into June. 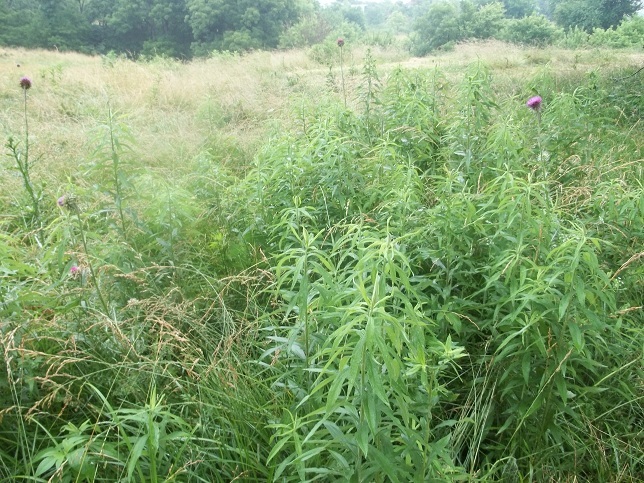 By June 11, 2012 the same spot in the picture above had reverted to a big thistle patch. Compare that to June 2 of 2013. 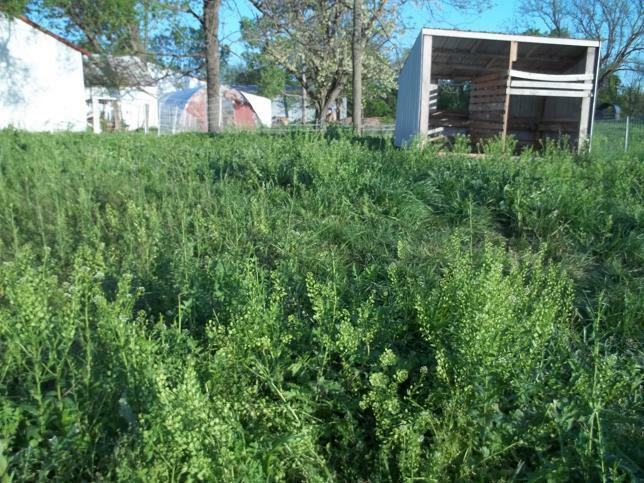 The thistle and weeds couldn’t establish in such high density because of our grazing practices and the increased soil health. Just mountains of fescue. So May 7 may be a week later than I really want but if there’s a late spring I’ll be glad for it. Going forward I think I’ll shoot for May 1st. I am also anxious to tighten up the calving window from 6 weeks down to 3 or 4. but I know that will be hard on the first-calf heifers. Guess that’s part of the program. Now I have to plan where to calve next year. Where indeed! 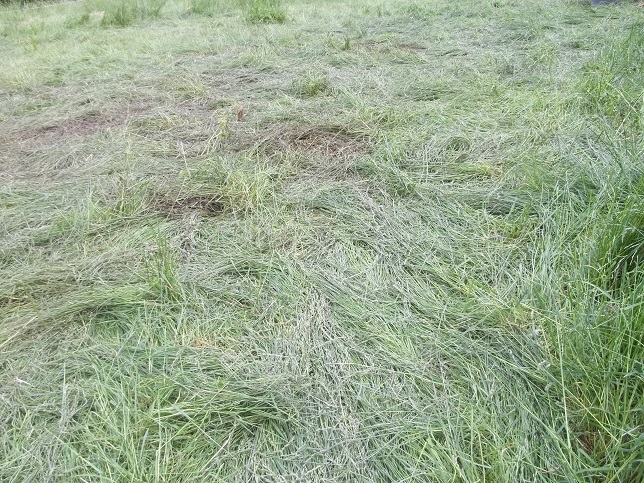 Are you planning your pasture usage on an annual basis? Did you plan for that weekend you’ll be in Sheboygan for a wedding? Did you make room for a drought reserve? Where will you put the cows during hot weather? During deer season? Better yet, do you have any tips to help me plan my own schedule? After writing this post I have to pause to reflect on two things. First, I’m really happy I took the time to document the state of my pastures on at least a monthly basis for the last 18 months. I can see changes, though, the changes may simply be due to weather patterns rather than grazing patterns. A few more years should really prove the grazing method out. Second, I seem to spend a lot of blog time focusing on cows, an enterprise I don’t believe will carry the farm. Why do I do this? I feel it is necessary to give the cattle a lot of attention BECAUSE the margins are so tight. I need the cows to cycle nutrients…to utilize a low-value resource (grass) and trample plant material, seeds and manure into the soil building the soil organic matter, water-holding capacity and soil life over time. The cows are uniquely suited for these purposes. They are the foundation on which I can build the rest of our farm’s future. I have to keep my pencil sharp or my foundation become shaky. This entry was posted in Cattle, Pasture Management and tagged Spring Calving. Bookmark the permalink. I’ve seen the year at a glance calendar that a couple of graziers use – can’t think which in particular at this moment, and I gather even without the calving issue, they’re still planning a year ahead. I really think your state of the pasture posts have been great, it’s a great way to keep track over the year(s). I’ve picked up on the idea in a less regular way, even though the only critters grazing out there are broilers right now. I’m not keeping track like I should be. Hoping to do better going forward. It has been a rainy year. I’m seeing a LOT of horse nettle and a couple of wild & undesirable mints in much larger quantities than I did last year. I think (hope) it is the rain, not my grazing. Yup. If I didn’t have the pictures… Heck, even with the pictures, conditions change. One day they seem to ignore the forage and look fat as could be. The next day they eat down to the dirt and look hollow anyway. What’s the difference there? Species seem the same. Who knows. Time should even some of that out. My dad seemed surprised when his calving went especially well one year. He believed the fact that he had opened up a new area to grazing he gave the calves a cleaner start. 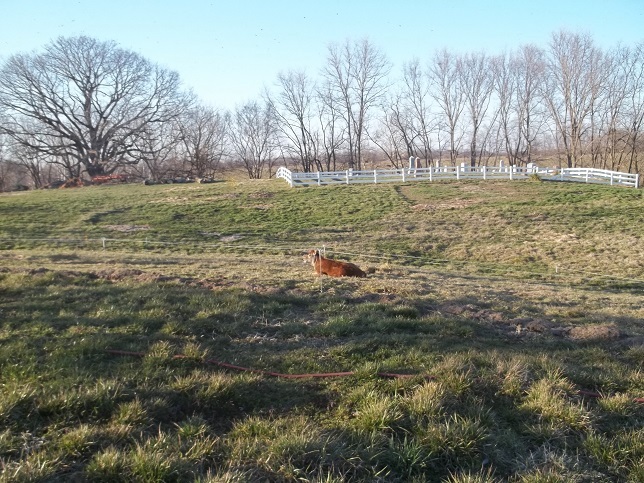 He and my uncle had cleared the ground and this was the first year cattle had ever grazed the ground – I mean ever. We can no longer open a new area each spring for calving, but bacteria and such need to be considered in the planning. Of course, there are naturally pests in areas even though cattle have never been there. Just something to think about. That’s pretty interesting and it’s kind of the point of the intense disturbance and long recovery cycles of our rotational grazing. The cows are about to cross the creek onto your 80 and haven’t been there since late June (I was in Florida). Not only do we break pathogen cycles by resting and grazing high on the plant (Cow parasites only climb 2 inches), the taller grasses put down deeper roots and bring up more minerals. Further, if we are managing correctly, we see increased forage diversity which also leads to better nutrition. All of that should stack the cards in favor of the cows at calving time. And, if a cow can’t wean a calf under our management, maybe she would be better off elsewhere so our future herd will be all easy-keepers.